Three hundred detained as Paris braces for ‘yellow vest’ protests – Royal Times of Nigeria. 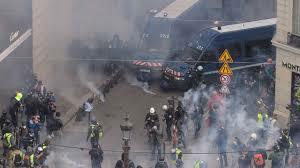 Paris police detained nearly three hundred people today ahead of fresh anti-government “yellow vest” protests which authorities fear could turn violent for a third weekend in a row. The protesters accuse President Emmanuel Macron of only looking out for the rich. Clad in their luminous road safety jackets, dozens of demonstrators, they gathered at dawn on the Champs-Elysees, the scene last Saturday of the worst rioting in Paris for decades. Protester Herve Benoit, said he and his friends had to come from the Dordogne in western France to Paris to be heard. He called on the government to boost people’s spending power and increase taxes on the wealthiest. Macron this week gave in to some of the protesters’ demands for measures to help the poor and struggling middle classes, including scrapping a planned increase in fuel taxes and freezing electricity and gas prices in 2019. 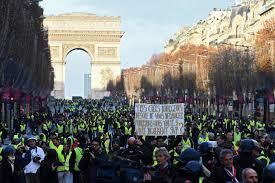 But the “yellow vests”, some of whom who have become increasingly radicalised, are holding out for more. Many are calling on Macron to resign.